Hello everyone. I did some more tidying and sorting in my craft room yesterday, and came across a whole stack of Stampin Up designer Series paper – goodness knows how long I’ve had this! I decided to use some of it as background for this card, which was inspired by the sketch from Hand Stamped Sentiments. This is quite a large card – an A4 folded into two, just so I could get four of my little animals in there. I used the Concord and 9th ‘Furry Friends’, and actually stamped and die cut them all out, in all their various forms, and decided to go with the ‘friends’ I have here. 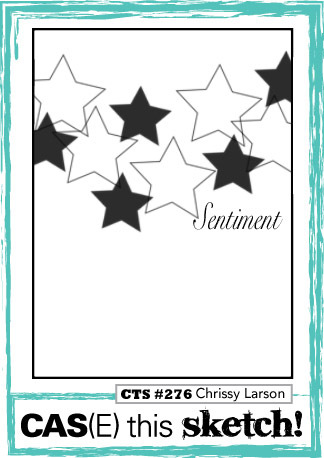 The circle die is also from Stampin Up, with the sentiment being from MFT – my usual ‘go to’ sentiment set. I shall be crafting again later, but I am going to see my mum and dad – he is 80 years of age today. I’ve got to go ans give him the card I made and posted on my blog yesterday. They only live 20-30 minutes away, so a mere jaunt in the grand scheme of things. Hi there. A quick card for you today, without any die cutting. I know – after the past couple of postings, I was kinda all die cut out……so I made this card with stamping only. I was going for a clean and simple look – which I believe I achieved. I used the small three star stamp from Concord and 9th ‘Shine On‘ stamp set, stamping the outline in Catherine Pooler ‘Midnight’ ink, then filling-in with an Altenew orange ink. The sentiment is from a Uniko stamp set, again stamped in ‘Midnight’ ink.